History is contained in the personal anecdotes of its participants. As players of the psychedelic era pass, it becomes increasingly important to document some of these tales, even if just for the humor. Here is one from a close friend of mine, who shall remain Anon. For more on the roots of Fluxus and the New York art scene, see (1981) ALTERNATIVES IN RETROSPECT: An Historical Overview 1969-1975 / Gain Ground, Apple, 98 Greene Street, 112 Greene Street Workshop, 10 Bleaker Street, Idea Warehouse, 3 Mercer by The New Museum, New York. In the fall of 1960 Leary had returned to Cambridge after ingesting psilocybin mushrooms in Mexico, an occasion he called “the deepest religious experience of my life.” He began to spread the word. 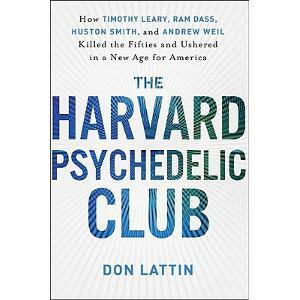 Leary immediately set up what would become known as the Harvard Psychedelic Project, experimenting with psilocybin and later LSD in tests he and others thought would revolutionize psychology and change the world. These drugs wouldn’t merely tap into our mystical consciousnesses. Leary was convinced LSD had practical uses too. A Friendly Account of an Infamous Year at Harvard, by Anon. In September 1960 I was a young poet newly arrived in Boston with my wife who had a fellowship to Harvard. I quickly lucked into a job one night a week as the attendant at the desk of the poetry room at the Harvard library, and I got free-lance editing work at a good publishing house, Beacon Press. I called my friend Ben, a savvy mentor who lived in Berkeley, California. Ben said he was suffering in Berkeley but he had two friends who had just arrived at Harvard, Tim Leary and Frank Barron, and Tim had a big house in Brighton. Ben said that Tim might invite Ben to stay in the large house. Ben said that Tim and Frank were transpersonal psychologists from the psychology department at Cal Berkeley that were experimenting with a powerful new drug at Harvard. Ben gave me Tim's phone number. I called and found that Tim did think highly of Ben. Tim said that if I got Ben an airplane ticket to Boston, he could stay in Tim's house and maybe help with the drug experimentation. I was glad I was able to help Ben fly into new horizons, where I myself had just landed. Within two days Frank Barron drove over to the apartment where Ann Rower and I lived on Beacon Hill, to visit a little and then to go to the airport to pick up Ben. Frank's wife Nancy was with him, a tall beauty Frank had met when she was a show girl in Las Vegas who came from a family steeped in academic anthropology. Frank was considered the world's foremost expert on creativity. He had interviewed T.S. Eliot, William Butler Yeats, and other prominent artists to study the creative experience (See Appendix: Frank Barron, by Michael Murphy). Frank told me about a remarkable experience he had the night before with the drug they were trying to study. He described going head on into death and through it, remaining aware. I figured it could be an enlightenment experience or a drug high or both. As we discussed Frank's experience from the night before I was sitting in front of the live fireplace, working the flames. Something paranormal and silent happened between Frank and me and the flames. The trip was on. On the way to the airport I learned that Tim had been shocked profoundly back in the spring when his wife committed suicide, leaving him with their two children, a 13 year old girl and a boy of 11. On the way from Cal Berkeley to Harvard that summer, Tim, his children, Frank, and Nancy vacationed in Mexico, at a rented Villa, for a month, and there Tim and Frank ingested large amounts of the famed psilocybe mexicana mushroom and had breakthrough experiences. Tim began to write a lyrical novel (which he once showed me). Then, by a golden stroke of history, they learned that Sandoz Pharmaceuticals had just synthesized the agents in the psilocybe mushroom into a pink, sugarcoated pill, bound to have a powerful effect on the mind. Tim took to the phone and locked a deal with Sandoz to be given a large stock of the drug to experiment with at Harvard. Sandoz was so happy. Tim and Frank were rocking. They arrived at Harvard in early September and cases of power pills arrived quickly thereafter, about 2 weeks before I met them. We got Ben at the airport and drove to Tim's big house in a Boston suburb, and there I met Tim. The scene had been designed by central casting with consummate genius. We went into a very large and comfortable living room. Ann and I sat on a couch near Tim and Frank. On a round table in front of us was nothing but a plastic drug container filled with small pink magic pills. On a couch across from us lay a human being, seemingly holding himself stretched out in tension, his arms at his sides. "Who's that?" I asked Tim. "That's the chairman of the Harvard psychology department," said Tim. "He's having a bad trip." I had opened the container and spread out some of its hundred pink pills that felt like a potent psychotropic agent, used by shaman and seers of Mexico to access super-reality. The mushroom is called the Flesh of God, I was told. I asked Tim how many pills the guy took who was laying there fighting the experience. Tim said that was 2 pills. I asked Frank how many pills he had taken the night before to experience death and awareness. Frank said two. Without hesitating I took 12. Tim and Frank were amazed. Ann took two pills. I was sitting cross-legged on the couch, and there I stayed for hours, unmoving. Ann sometimes sat beside me, sometimes hung with Tim, Frank, and Nancy. Across from me the professor laid out flat, tense and unmoving, for hours, and I sat cross-legged on the couch, hour after hour, silent, smiling, in open awareness, and having a very good time. From time to time Tim or Frank would gently come up to me with clipboards, pens, and paper, seeking reports. I smiled at them knowingly, remaining silent. Finally, after several hours, the young poet spoke. I said something like I'd been experiencing the understanding beyond understanding. Ann also had a good trip on her 2 pills. Tim and Frank and Ben all seemed happy with Ann and me. We had done well on the super-drug. At my request, Tim gave me a plastic container of 100 of the pink power pills to take home with me to experiment with. Score that for poetry. Can't beat that as a first meeting with Tim. I smoked marijuana, and was hip to other traditional drugs, but these pink pills took drug taking into new ground. Tim and I were to become friends, and that house had many memorable gatherings that storied year. About 7 days later I had my first scheduled session to be attendant at the desk in the Harvard poetry library. I ate six pink pills, took a big stash of paper and a few pens, kissed Ann goodbye, and went off to work, through public transit to Cambridge, confident that I could extend the English language, right there in the hall of poetry at Harvard, on my very first night on the job. The drug hit just about as I started up the steps into the library. Someone who worked there showed me the desk I had to sit at. I sat down and assumed command. No one bothered me for the 6 hours of my shift, and I wrote 55 pages of excited poetry, getting innuendo and overtone in the lyrical flow, finally feeling free as a poet. The language had been chemically liberated, but the drug felt like a timely tool of human development. That was indeed a memorable night. To add to the generally charming scene Ann and I had landed in, Frank decided that I was "one of the two or three best poets alive." This stroked my ego big time. I was somehow relieved of my duties at the Harvard library poetry room after the one great session. But I continued to work on good books for Beacon Press and take six pink pills once a week to plunge into the untapped potential of English poetry. Or so it seemed on the joyride. Frank showed my poetry to Charles Olson and Allen Ginsberg, who were among many people attracted to the powerful drug. One night Tim called me and asked for my help. He said that he'd brought William Boroughs to America, to his house, to help promote the use of drugs in society, but Tim had some big tasks and needed someone to pal with William in the house while he went to his office at Harvard. William at that time was my favorite new writer. I had read The Naked Lunch twice. Being asked to take care of William for a while was as much fun as being given the Harvard poetry room to write in. William had been a heroin junky and was generally nervous, and double nervous about being back in America after decades of living in Morocco. He experienced America as a police state and was in serious need of drugs to calm down. Unfortunately Tim only had the pink psychotropic pills, two of which had almost killed William when he arrived the night before. What William needed was some good marijuana, but we didn't have any. Tim left, and William, Ann, and I were alone. In a back room I found some dried psilocybe mushrooms and shredded some which rolled nicely into fat joints which we smoked with a mild result. William calmed down and since he liked young men, and liked Ann, we mellowed into a peaceful place, under clouds of smoke in a back room in Tim's house, getting into some free exchanges. Suddenly there was a loud knock and call at the door to the room we were in. I rose and opened the door. Two big Boston policemen were standing there. William froze. I jumped at the cops demanding to know what they were doing in the house without being invited. I was aggressive, They were at fault and went on the defensive. The room stank of herbal smoke. I moved at them through the doorway, blocking them and sending them backwards. They were on their heels muttering about looking for two little girls in nightshirts from a slumber party next door. "What!?" I said with a raised voice, moving them out the back door with my energy. "You walk in this house uninvited looking for little girls in pajamas?! They're not here but we'll help you look". William was delighted. We walked across the yard helping the cops seek the girls, for about two minutes. Then Tim returned with a big dinner, happy to see William smiling and for the moment at ease in America. Throughout the year I continued to frequent Tim's house. I knew of his work in the prison system, including his tragic first effort in which two of the 6 inmates who participated committed suicide. Various applications were explored. Later in the year LSD entered the scene. There were visits by Alan Watts and Arthur Koestler. I somehow never connected with Richard Alpert (Ram Das), who had been Tim's teaching assistant, but I was well-connected with both Tim and Frank. Once Tim and I took mescaline together, sitting by ourselves in a room for hours. That was a mostly nonverbal session, but we pulsed together at that time like we were experiencing an acceleration of history and awareness. The year ended with a crash for me. I was having one of my 6 pill poetry generation sessions, which had been fruitful and unproblematic on a once a week schedule. This time just minutes into the power ride something went wrong. I began to see only mutilated bodies, hellish disasters, twisting my mind. I told Ann I was having a bad trip and I was going out to walk it off. I walked along the Charles River, for hours, in a state of profound paranoia and horror, yet able to walk through it. Finally most of the drug effect wore off, but for 10 days or so I was beset by paranoia, and even if I didn't react to it the state was debilitating. I went to see Tim. Alan Watts was there. Ideal, right? I had a chance to talk to them both about the downside of the drug experience. The downside was the opposite of liberation. It was self-inflicted sickness. Neither Tim nor Alan was of any help whatsoever. That's where it ended. I recovered and went on. I never saw Tim again, but his story is well known. 48 years later I see that my work in language became work in medicine, evolving a language of medical and childbirth methods. As an integral part of the process I devoted myself to Tibetan doctors and meditation teachers for 20 years, 1970-90. I slowly took my work in language into the fields of mind/body and energy medicine, in the paradigm shift. I've produced meditation programs for cancer care and HIV-AIDS care, and a birth program. In 1967 I was an art gallery director and art critic in New York, and because I was full of my need to have a new kind of gallery exhibition space for the use of language in three and four dimensional contexts, using various kinds of technology, in April, 1967 I opened Gain Ground, the first of what were later celebrated as the non-objective art galleries. The initial exhibition showed more than 50 unique works by poets, including the first artwork books, works of mirror and words, language and color, language and light, and more. You approached the table edge and looked down into the mirror, and as you bent over the face in the mirror came up to you, from below, alive with species implications. You could see your ancestors and new faces as fast as you could see. The words alive and move worked with your live image to make you the dramatic subject of a work of pictorial art. And there were 6 other live photograph chambers in which you were the dynamic subject. In 1968 I produced another Gain Ground show reversing the subject-object relationship to get something alive in a work of art: Power Throne. The exhibition consisted of a series of rooms presenting heart sound. When it was your turn, an attendant guided you to the inner chamber and parted the curtains for you to enter a red fabric throne room. Two priestesses in red dresses came to you graciously to seat you in the power throne. The throne itself was a transformed dentist's chair, with racks of electronic equipment behind it. A red velvet sash was placed across your chest and your hands were placed one over the other over your heart. What you didn't know was that you were holding a very fine electronic stethoscope over your heart, and concealed behind the throne was the technology called harmonic compression, developed by Bell Labs, that would help you hear in a new way. After you were seated, microphoned, and relaxed, the priestesses disappeared behind you to work the equipment carefully. In the first phase you heard your heart coming from 4 speakers in the walls of the chamber, with more information audible in the heart sound than anyone had ever heard. The sound system was engineered by Phillips Electronics and Norman Dolff of Columbia Records. There was an immediately perceptible feedback field. Far faster than thought, mind affected heart. Then the priestesses placed a pair of fine hi-tec head phones over your ears and you heard the full expression of your heart in your brain. Then into electronic mix with your heart sound came a voice in harmonic compression, twice the speed as normal speech but with the same pitch as normal speech, so you hear twice as fast. And the words you hear are about what is beating in your heart. GOES WRONG THERE THE WHOLE BODY OF LIFE HAS THE PAIN. WHO KNOWS WHAT'S WORKING MIRACLES RED ALL LIVE IN YOU. WHAT RUNS YOUR ORGANS GLEAMING WITH WHAT THEY DO. WHO KNOWS WHAT ELECTRIC LIQUIDS CREATE IN YOUR HEAD. THE UNIVERSE IS EMPTY WITH WHATEVER BEAT YOU HAVE. HOW SHOULD YOU KNOW THE SPEED OF YOUR FLESH IN ITS ACTION. IS IT REALLY BEST TO NOT KNOW YOUR ELECTRIC RUSH. HAVE YOU EVER FELT YOUR HEART VIBRATE SUPERNATURAL TISSUES. OR DO YOU ONLY FEEL YOUR HEART WHEN YOU'RE FRIGHTENED. OR WHEN YOU MAY BE A LITTLE WORRIED YOU'VE OVERPUMPED IT. OR AREN'T YOU THE ONE WHO'S PUMPING YOUR INCREDIBLE FLESH. OR AREN'T YOU BEING WORKED IN THE HEART YOU HAVE. NO MATTER WHAT YOUR GENES ARE DESIGNED TO BEAR. SO WHATEVER YOU CAN CATCH YOUR HEART WITH YOU BETTER GET. DON'T HOPE THAT SLEEP WILL MAKE YOUR LIFE SOMETHING ELSE. THE HEART BEATING IN YOU CAN GO EVEN FASTER IN SLEEP. Frank [Barron] once described the highly creative person as "both more primitive and more cultivated, more destructive, a lot madder and a lot saner than the average person." In their studies, he and his colleagues found that the most highly creative participants appeared highly neurotic on personality tests but also showed high levels of ego-strength that allowed them to direct their pathology into their work. They also tended to resist conformity and proved to be more willing than others to take risks. Frank believed that important creative advances require a high endurance of disorder and a predilection for complexity, working in concert with the ability to distill order from chaos. Many of us who knew and loved him acknowledge that his personal style reflected many of these qualities. One of his friends from IPAR described Frank as someone who "worked in a way that might seem, if you hadn't followed it for very long, to be casual and without focus. But after a few years, it became clear (to me) that there was an inner compass that guided him, and continued to guide him for all of his life." He once said in a discussion about his work: "Creativity requires taking what [Albert] Einstein called 'a leap into the unknown.' This can mean putting your beliefs, reputation, and resources on the line as you suffer the slings and arrows of ridicule." Two of his books, Creativity and Psychological Health (1963) and Creativity and Personal Freedom (1968), are considered classics in the field, and the Barron Ego-Strength Scale and several other personality tests he designed are still in use.